Filling the tourist square and our tummies with Shrimp and Crab Cocktail and Sourdough Roll on Fisherman's Wharf. Next stop - Ghiradelli Ice Cream and Chocolate Shop for Hot Chocolate with Caramel and Sea Salt. Outstanding! 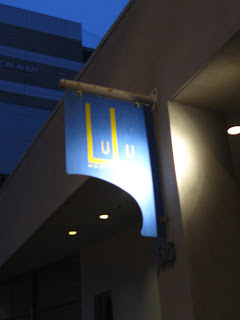 Dinner with Dianna's nieces and nephew - Brandon, Lindsay and Ashley - at LuLu's for wood-fired pizzas, pasta, seafood. Antipasti of olives, homemade salumi and eggplant was good, as was everything else. Breakfast this morning at Dottie's True Blue Cafe, as seen by Dan, our Diners, Drive-Ins and Dives food guide. Next time we'll bring him along! Loved the Grilled Cornbread with Pepper Jelly, Scrambled Eggs with Ham and Gruyere and Black Bean Cakes with Salsa and Eggs. We're not finished eating yet! the shrimp sure look yummy! C - I envy you SO! but am stuffed just thinking about it! Goodness, have some crispy pizza for me, girl! We were just talking tonight about our trip to CA in June - so wonderful! - & we didn't even go into SF!!! Ah man... I should have totally tagged along with you! The one thing I wanted was fresh crab, and I just never made it over there to get any. Yummy! San Francisco is a delicious city! It was lovely to see you again, Cora!